David de Gea boasts an undisputed title as the Premier League’s top shot-stopper, but that isn’t to say it has always been plain sailing for the Spaniard. 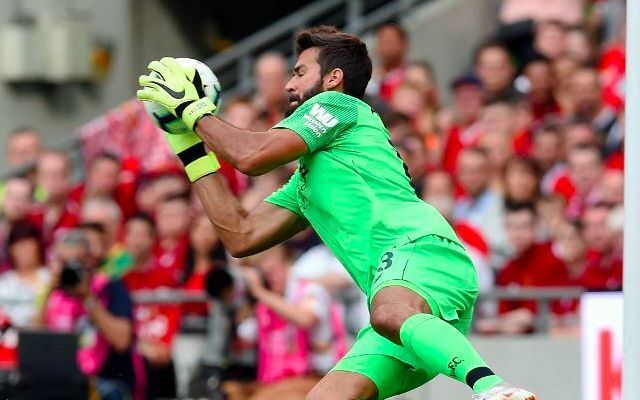 Liverpool legend Bruce Grobbelaar believes Alisson can start his Anfield career without enduring the tough introduction that raised concerns over De Gea’s value early on in his time at Old Trafford. The Manchester United no.1 looked a nervy and fragile figure between the sticks after signing from Atlético Madrid in 2011. Arriving five years older than De Gea was at the time of his move, Alisson looks in better shape to adapt swiftly to the often daunting surroundings of English football. Alisson wasted no time in providing a teaser of his ability on the ball in Saturday’s 5-0 win over Napoli as he found Mohamed Salah with an expertly-weighted 50-yard pass. Though Liverpool didn’t spend a world-record fee on the Brazilian’s feet, it marked early reassurance of his glowing reputation as reliable distributor. A standout maiden season as Roma’s starter entailed regular doses of the staggering reflex saves and speed across his line expected to lay the foundations to Liverpool’s Premier League title charge. He imposes a natural aura of reassurance and composure that Loris Karius has struggled to offer since his arrival from Mainz.